This is the second year in a row that I am missing out on Halloween. Last year, Philip and I spent the entire day on a plane and then when we got home I had to start unpacking from the move. We actually forgot that it was even Halloween which is very unusual for us. This year I have a lot going on in the store as I prepare to fly to Norfolk tomorrow for a week and a half so Halloween is going on the backburner again. Philip and I have been watching lots of horror movies for the past few weeks and we did go to the produce stand to get pumpkins and cider. 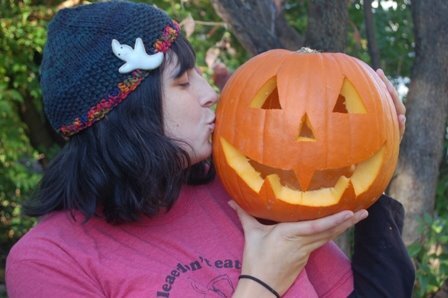 We carved the pumpkins, roasted the seeds, and drank hot apple ciders on Sunday in between errand running. Here is my cute little pumpkin. I opted for something simple so I would have more time for the other festivities. His name is Vladi von Pumpkinovich and most of the year he works as an airline pilot for Delta, but on Halloween he likes to scare the kiddies. Also, the hat I am wearing in the picture is from my secret pal, isn't it festive? Next year for Halloween we are going to go all out. We will start celebrating around the 15th so that we can fit in all of the festivities and I definately will not be flying anywhere on or around Halloween day. We will miss you, Robyn! I am loving Mr. Von Pumpkinovich... he is so evil in that cute kind of way. Wow --- didn't know Lexington was a Delta hub. . .
Have a safe, happy trip!